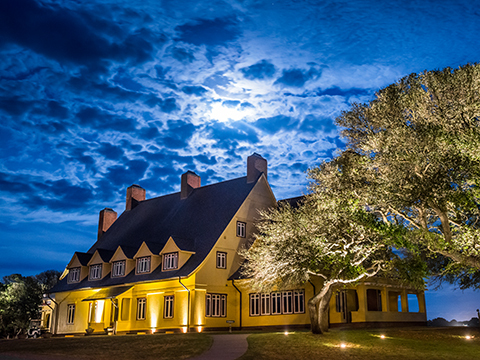 Have you ever wondered what an evening dinner would have been like at Whalehead in the 1920s? On December 1st, 5:30 – 8:30 pm, join us for a Whalehead epicurean evening featuring a special candlelight tour of Mr. & Mrs. Edward Collings Knight Jr’s legendary winter retreat followed by a classical banquet reminiscent of 1920’s hunt club fare. The Whalehead Estate will light up for Christmas and invites guests to delight in a gourmet multi course meal complemented by fine wines. Savor almost century old recipes from The Gun Club Cook Book on historic Whalehead’s front porch as the original Steinway piano sets the tone for an unforgettable evening. Dress in your festive hunting and roaring twenties inspired attire.